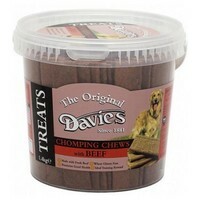 Davies Chomping Chews Beef are delicious semi-moist treats that are made with 50% fresh meat. They are ideal occasional rewards for your pet and can be used as training aids; your dog will love the delectable meaty flavour! Davies chomping chews contain no added artificial colours and are wheat and gluten free so they are perfect for wheat intolerant dogs.